We can help you find the epistemology books you are looking for. As the world's largest independent marketplace for new, used and rare books, you always get the best in service and value when you buy from Biblio.com, and all of your purchases are backed by our return guarantee. Wilmore, KY Department of Philosophy, Asbury College, 2001. Paperback Near Fine in Wraps: shows only the most minute indications of use: just a hint of wear to the lower front corner; a couple of small, faint spots at the rear panel; Address label at rear panel; else flawless. Binding square and secure; text clean. Very close to 'As New'. NOT a Remainder, Book-Club, or Ex-Library. 8vo. 117pp. D.Z. Phillips [Advisory Editor]. Essays by Rush Rhees, Peter Winch, Lars Hertzberg, M. Jamie Ferreira, John H. Whittaker, D.Z. Phillips and N.K. Verbin. Paperback. Berkeley, CA University of California: Campus Editions, 1974. Paperback First Edition Thus, First Printing stated. First Ed thus; First Printing indicated. PENCIL UNDERLINING for the first thirteen pages of text. Else, Good+ in Wraps: shows indications of moderate use: shows the slightest spine lean; moderate wear to extremities; fairly heavy rubbing and faint soiling to wrapper covers; a bit of sticker residue at the upper front panel; a bookstore "cut-out" hole has been hole-punched at the upper rear panel. A sturdy reading copy. NOT a Remainder, Book-Club, or Ex-Library. 8vo. 355pp. First Edition thus; First Printing stated , reprinted from the Second Hardcover printing of 1973. University Press Paperback. Baruch Spinoza 1632  1677, was a Dutch philosopher. 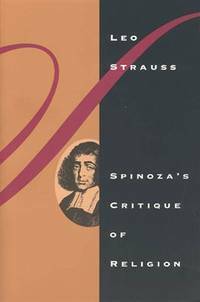 The breadth and importance of Spinoza's work was not fully realized until years after his death. By laying the groundwork for the 18th century Enlightenment and modern biblical criticism, including modern conceptions of the self and, arguably, the universe, he came to be considered one of the great rationalists of 17th-century philosophy. His magnum opus, the posthumous Ethics, in which he opposed Descartes's mindbody dualism, has earned him recognition as one of Western philosophy's most important thinkers. In the Ethics, "Spinoza wrote the last indisputable Latin masterpiece, and one in which the refined conceptions of medieval philosophy are finally turned against themselves and destroyed entirely." Hegel said of all contemporary philosophers, "You are either a Spinozist or not a philosopher at all." London: Tavistock,. Paperback. 243pp. A study of The Archaeology of Knowledge and Foucault's concept of ''genealogy of knowledge'' and his views on Friedrich Nietzsche.Â Very rubbed and very thumbed. Sunned to spine. Binding is sound. Reading copy only. Reading copy only. . Paperback. 1980. Englewood Cliffs, NJ Prentice-Hall, 1962. Paperback First Edition; later printing. Five pages show INK MARGINALIA, and one of those pages shows UNDERLINING IN INK. Else, Very Good+ in Wraps: shows indications of very light use: light wear to extremities; mild rubbing to wrapper covers; binding shows barely discernible lean, while remaining perfectly secure. Remains close to 'As New'. NOT a Remainder, Book-Club, or Ex-Library. 8vo. 178pp. Essays by B.A. Farrell, John Wisdom, D.W. Hamlyn, Norman Malcolm, U.T. Price, Errol Bedford, P.F. Strawson, Paul Ziff, and J.J.C. Smart. First Edition; later printing. Textbook Paperback. Oxford: Pr. at the Theatre for James Fletcher; and sold by R. Baldwin, London, 1754. 8vo. 59,  pp. Two sermons preached in opposition to the scepticism of Viscount Bolingbroke; Parker was a royal chaplain. ESTC T39689. Removed from a nonce volume. Very good condition. University of Chicago Press, 1997-01-01. 2nd. Paperback. Good. Paperback has light wear to cover. Ink name on front inside cover, else clean and tight.Your purchase benefits literacy and summer reading programs in Cincinnati and Hamilton County, Ohio. We ship every business day. All books ship in cardboard bookfolds with delivery confirmation. Edinburgh: William Tait, 1828. 8vo (22.5 cm, 8.75"). XXXI, , 692 pp. ; port. Brown (17781820) was of the Scottish School of Common Sense but was not as central to it nor as totally committed to its principles as Thomas Reid and Dugald Steward. His career was centered in Edinburgh, and in 1810 he was appointed conjoint professor of moral philosophy with Stewart and took over the teaching duties of the chair. He was a dazzling lecturer and his lectures were published after his death, with several editions in the 1820s and early 30s. The frontispiece portrait of Brown was engraved by W. Watson after George Watson's 1806 portrait. The volume contains "a memoir of the author, by the Rev. David Welsh, minister of St. David's Glasgow." Provenance: Bookplate of William S. O'Brien and with his note "This book is to belong to [my son] Edward William after my death [.] William S. O'Brien [,] Christmas, 1859." Binding: Mid-19th-century polished tan calf, spine gilt extra, single gilt rule on boards; gilt roll on board edges. Binding as above, small scuffs and joints (outside) very lightly abraded; paper of the front hinge partially open and with "invisible" cello tape repair (cover firmly attached). Back pastedown and lower outer margins of a few index leaves with spots of worming, not touching text. => A nice copy.